This is the type of Wealth God statue that the ultra rich tycoons have been spotted as having in their homes. In order to make this version of Military Wealth God more affordable to more people, we have successfully reproduced the statue to bring down the price. This classical masterpiece is authentically crafted to impress. 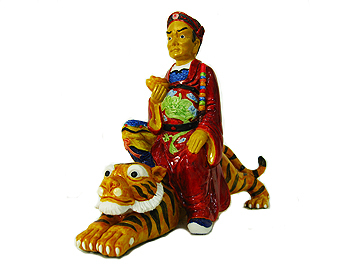 The Military Wealth God is very popular among tycoons and businessmen in Asia. His looks are more confident, grandeur and victorious compared to other Wealth Gods. 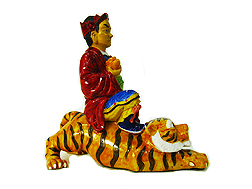 He sits on a ferocious tiger, thus making him having extremely powerful command over wealth. He carries a gold ingot and a multilevel military varja weapon. The magical varja weapon enables him to punish all evils and to destroy all ignorance that could lead to being cheated. 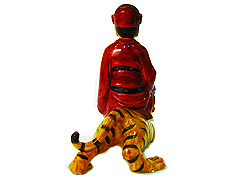 The tiger swallows all evil in the surroudings. This item is most suitable for homes, mansions, business premises, lobbies, receptions and cashiers. 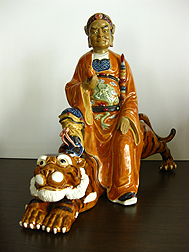 Those who desire to seriously multiply their wealth, businesses and income luck can invite Him to display at home in the living room or at the business premises. Note: Item comes properly packed in a free gift box. Zhao Kong Ming was once a famous general in ancient China. Knowing that he was a righteous, honest and just man, the heaven's Jade Emperor bestowed him the role of distributing earthly wealth and assisting the earthly man to chase back any bad debts. 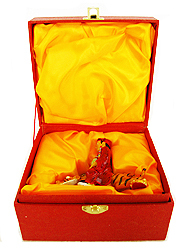 Hence he is often prayed for abundance, prosperity and wealth luck for careers, sales and businesses. For those in business, his presence will ensure all bad debts to be returned without much trouble. The Military Wealth God comes in a few forms, different styles and robes. The most classical and authentic of all comes in the more casual form where the robe he wears is more like the one of civil robe rather than the kwan kung's type of military robe. 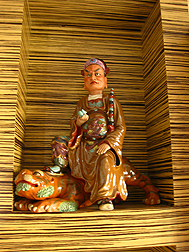 The robe he wears usually has a powerful image of the dragon to cover His belly. The photo images below show the type of Military Wealth God that were spotted in the homes of truely rich tycoons. Note: Kindly do not play him on floors, bedrooms, kitchen and toilets. 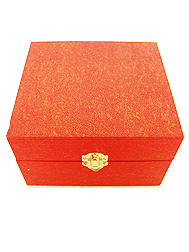 This high quality ornament is originated and custom made by Feng Shui Bestbuy.